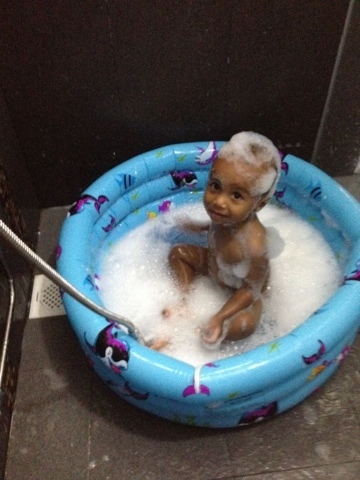 Ashayr loves the water. Each time he sees the swimming pool, he screams in delight! But.. because Mama is now like a whale, I don't fancy going swimming at public pools. Lol. So.... The solution is! 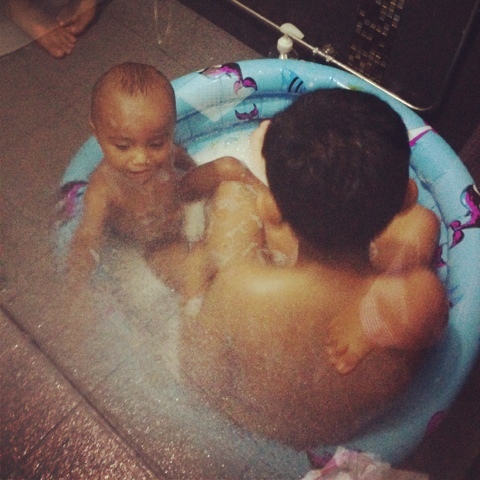 Abah who is very good and fond of "layan-ing" his boys, bought a tiny inflatable pool for the little boy. Punya lah suka ini anak. Jari sampai kecut sebab rendam lama sangat! Haha! 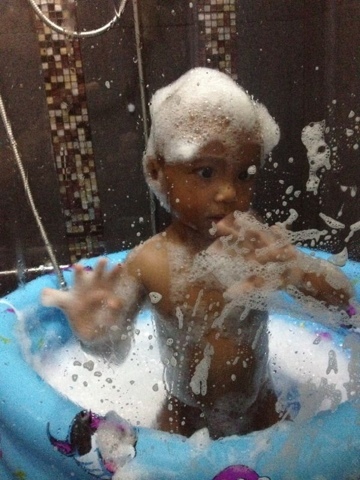 And his Abah has introduced bubbles and foam to him. So konon macam ada private foam party la. Funny this boy. Such a joy he is. He turned 16months a few days ago and it amazes me how fast he has developed. Ashayr is much chattier and friendlier nowadays. MaShaaAllah. Enjoy the private pictures! Lol. Pernah tak awak rasa tahap kesabaran awak tercabar? Well, I have. Many many times. Sometimes people are out to test your patience. Maybe it's just God's way of challenging you and seeing how far you can go. I do not like to pretend like everything is OK when it is not. I don't like to paint roses and rainbows all the time. But that doesn't mean I have to dish out my dirty laundry in the open and let people judge and scrutinize. When I think a storm has passed, suddenly came along another dark cloud. Why God? Why? But, I've been through madness and back. So it's ok lah kan.. Patience and faith are what keeps me sane. This patience thing is a skill I tell you. Of course it's much easier to just blow up, explode and splatter that anger to people around you. But staying calm and composed, despite being challenged, that is honorable. Now that I've somewhat honed my "patience" skill, I bite back only when necessary. People will try to poke and prod you just to test your patience to see how you react, but it angers them even more to see you so calm and collected despite being tested. Find that right moment, to express your thoughts and feelings, a point that allows the other person to be regretful of his/her actions/words. I know this is easier said than done because for many of us, patience is not something that comes naturally to us. However, I strongly believe that patience can be cultivated. When you're a more patient person, you're able to handle stress better and that makes you a happier and healthier person. Not only that, I feel that it can also result in clearer thinking, which means better decision-making. Jangan buat sesuatu ikut perasaan suka hati mak bapak je. Think before you act. 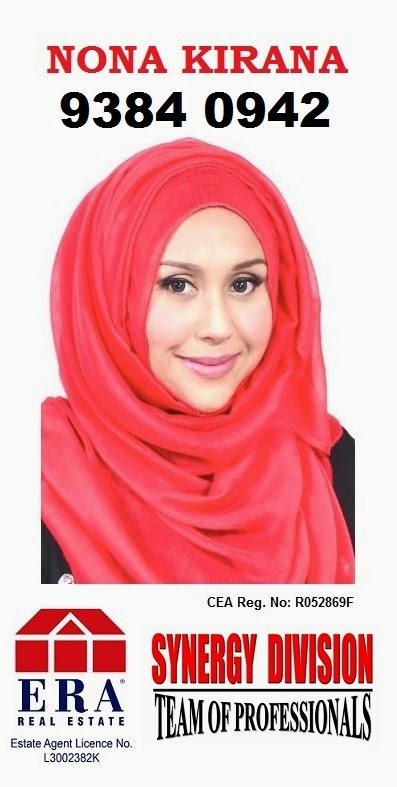 Kalau dah betul-betul sangat rasa tercabar, alihkan perhatian pada perkara yang membahagiakan. Focus on the things that makes you happy. Happiness is a choice. Happy people are simply less likely to get annoyed over the little unimportant things in life. When you nurture yourself by getting enough rest, spend quality time with the people who matter in your life, eat well, you become less irritable and more patient as a person. Take time for yourself and work on the goals for your happiness. Patience can seem unachievable to those of us who struggle with it. I used to have a problem with patience but now I'm better at managing it. My patience is being tested now and then. But I am keeping faith that Allah knows what's best for me and He won't give me what I can't handle. [Qur’an 3:200] “O you who believe! Endure and be more patient..”. 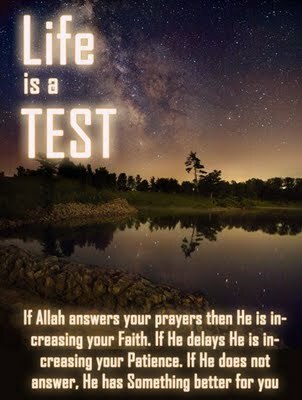 [Qur’an 2:155] “And certainly, We shall test you with something of fear, hunger, loss of wealth, lives and fruits, but give glad tidings to As-Sabirun (the patient)”.